At work, I am participating in a Health and Wellness program that encourages city employees to eat right and exercise. Being at the library, I have a head start on all of the information I need about exercise and diet. Three fat chicks on a diet: because we're all in it together is an excellent book in trying to decide what diet is right for you. You get the pros and cons of each diet, guilt-free ways to snack and still stay with the program, and straight talk for making the diets work for every meal of the day from not only the authors but opinions culled from their online forum. Once I decided what diet I wanted to try, keeping on it has been hard. One gigantic help has been the website DietFacts.com. They find the nutritional information on various store brands as well as tons of restaurant information. The best part is that they don't promote one diet over another so you can find not only carb information, but also calories. Its like having your own nutritional labels that you can read before you buy. And I couldn't get by without finding some good recipes when I have time to cook at home. 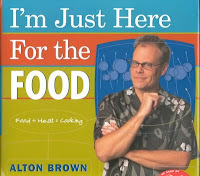 I love Alton Brown's [of Food Network fame] I'm just here for the food: food + heat = cooking, because it explains why you cook certain foods in certain ways, but unfortunately, he doesn't do calorie counts. For that I can read a book such as The Good Morning America cut the calories cookbook : 120 delicious low-fat, low-calorie recipes from our viewers. Or I can also go to my favorite cooking website, Recipezaar.com, which converts all of their recipes with the calories and fat per serving. As for exercise, the library has tons of DVDs from cardio to pilates to bellydancing! Kathy Smith is the queen of aerobics, and The rules of fat burning doesn't dissapoint with five separate workouts. Since there is such a variety of DVDs I won't get bored. Keeping to a schedule will be the hardest part. The year 2008 has been one of the most active and interesting years in decades for politics. There has been record voter turnout, and technology has allowed us to keep up with up to the second information (my favorite: CNN's amazing touch screen map--I want one of these at home on my wall). However, as much as I am enamored with technology, I still like to hold books in my hands and read in-depth information that is much harder to find on the internet and in 30 second soundbites. So I've decided to take a look at books written by presidents. Some presidents are more prolific than others. For instance, Jimmy Carter has written over 15 books, while Gerald Ford's entry on my list was actually "written" by Thomas DeFrank and is comprised of interviews between the author and Ford. Presidents writing books is rarer when you go back through time, so mostly 20th century presidents are represented. One interesting exception is the diary of James Polk, who managed to add three states to the U.S., issue the first postage stamp, and abolish the bank in one term as president. A couple of the writings are more personal than others, but all are entertaining. Click on each book to see the Arlington Public Library's holdings.